A microchip implant gives your pet the best chance of returning home to you if lost. However, a microchip must be registered along with your current contact information in order to identify you as your pet’s parent and contact you. Remember as long as there are pets, even those belonging to the most responsible parents, they will go missing. A microchip in my pet? 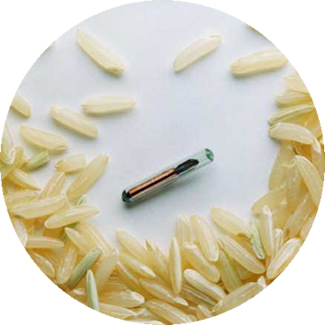 A microchip is a small, electronic chip enclosed in a glass cylinder that is about the same size as a grain of rice. They are implanted by injecting under the skin with a hypodermic needle; This is no more painful than a typical injection, although the needle is slightly larger than those used for injections. No surgery or anesthesia is required to implant a microchip, and it can be done during a regular office visit. Another common time to implant a microchip is during a routine spay & neuter surgery. Can a microchip track my pet? A microchip is NOT a GPS device, and it won’t track your pet if lost. Microchips transmit an ID number to the scanner as it is passed over the pet; This number appears on the screen of the scanner. Although the present technology microchip itself does not contain your pet’s medical information, however, some microchip registration databases will allow you to store that information in the database for quick reference. Will the microchip harm my pet? Reactions to implanted microchips are rare, as is demonstrated by the fact that millions of animals have been microchipped with very few reported problems The most common reaction is movement of the microchip from its original implantation site.Other problems include failure of the microchip, hair loss, infection, and swelling. With these infrequent problems, the benefits of microchipping pets definitely outweigh the risks. Dogs with microchips are more than twice as likely to be returned to their owners, and microchipped cats are almost 20 times as likely to be reunited with their families. The most common reason microchips fail to reunite pets and families is incorrect owner information (or no owner information) in the microchip registry database. – so don’t forget to register and keep your information updated! When your pet is microchipped, you’ll be provided with information on registering the microchip and updating your information. Which microchip is used at Riverside Vet Hospital? Just as important as it is to microchip your pet, is to register your pet’s microchip. To do this please visit Petlink’s website and click on the tab REGISTER YOUR PET NOW.